Join Rev. 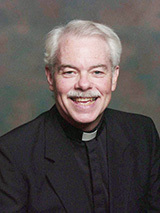 Paul Fitzpatrick, S.M. this summer as he leads a pilgrimage through the Holy Land from May 28 to June 4, 2017. Fr. Paul will take pilgrims to the sea of Galilee, Nazareth, Bethlehem, Jerusalem and other famous biblical sites. Meeting & assistance at Ben Gurion Airport upon arrivals and departures. Three nights’ accommodations in Tiberius in double occupancy with breakfast & dinner. Two nights’ accommodations in Jericho in double occupancy with breakfast & dinner. Four nights’ accommodations in Jerusalem in double occupancy with breakfast & dinner. Nine days sightseeing in modern air conditioned private bus. Entrance fees to the biblical sites and national parks mentioned in the program. Special dinner at oriental restaurant. One lunch of St. Peter’s fish in Tiberius. Tips for guide, driver and hotels, Portage at hotels. Brochures about the pilgrimage are available in Mystical Rose Oratory (chapel). Rev. Paul E. Fitzpatrick, S.M.